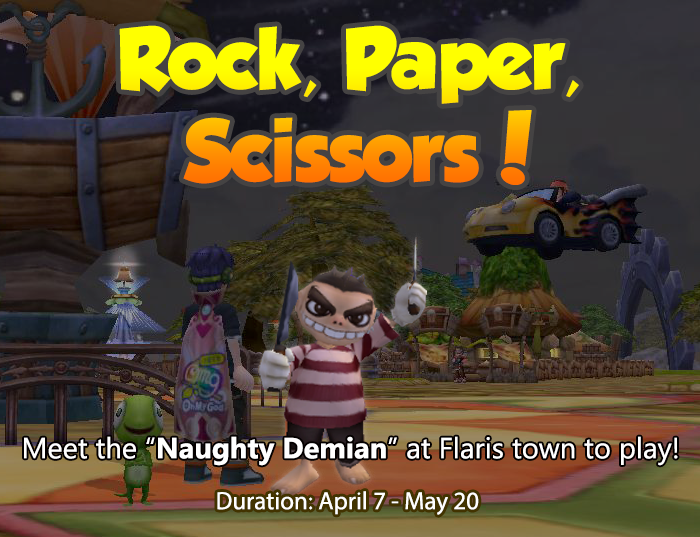 Rock Paper Scissors + Superhero event! April 7 2019, 2:00 a.m. Win once and you'll be rewarded with 9 Mysterious Pills . Win twice in a row and you'll be rewarded 5 Event Moonstones(bound) . Win 3 times in a row and you'll be rewarded 8 Event Sunstones(bound) . Win 4 times in a row and you'll be rewarded with a Scroll of Party EXP(7-days) . 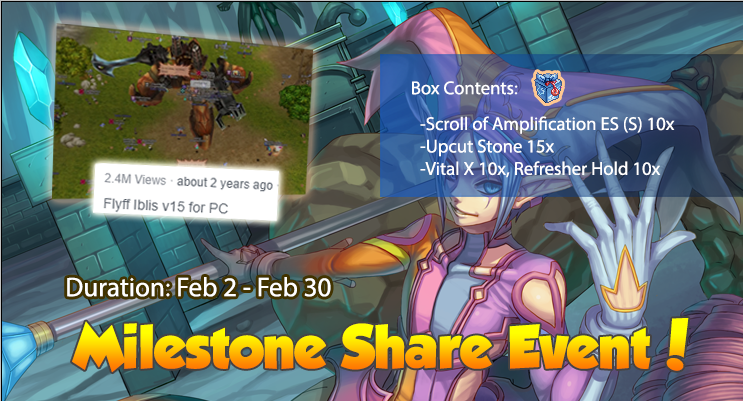 Win 5 times in a row and you'll be rewarded with 2 Scrolls of Amplification ES (S) . Win 6 times in a row and you'll be rewarded with 6 Scrolls of Reversion . Win 7 times in a row and you'll be rewarded with 3 Blessings of the Goddess(bound) . Win 8 times in a row and you'll be rewarded with a Chameleon Pet. Win 10 times in a row and you'll be rewarded with The Hot One . The catch? Well, you need to hunt for Pumpkins which are dropped by all Masquerpets level 20 and above. Trade 5 Pumpkins and 100,000 Penya for a Coupon from the "Mayor of Flarine". This mischievous munchkin won't give you the time of day unless you bring him a Rock Paper Scissors Coupon ! In addition, we all become a Superhero! All players get a passive +100 ATK and DEF boost. This is beneficial to low level toons. 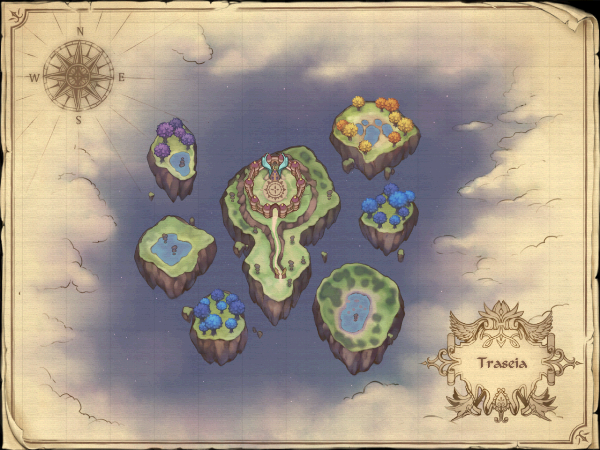 March, 1 2019, 12:30 p.m.
-GM will enter Flaris town CH2 on the day of the event to get players who are willing to join. 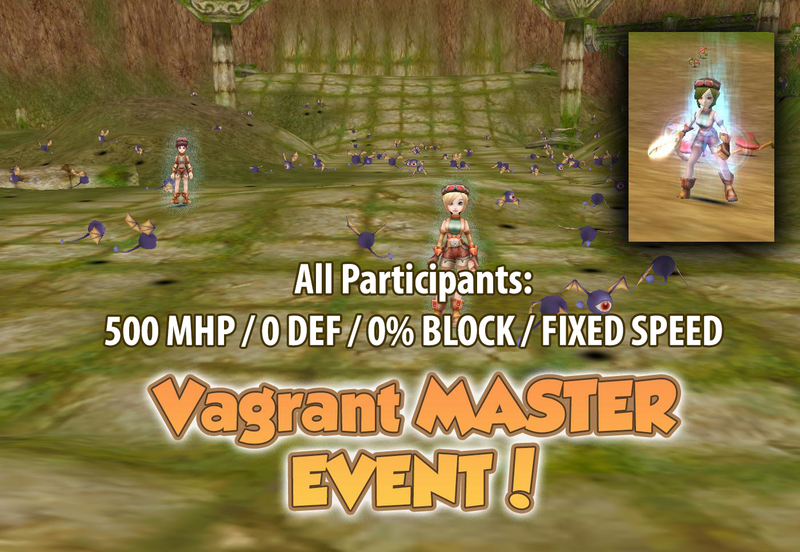 -All vagrants inside the event area will have fixed 500 HP, 0% block chance, 0 DEF, fixed speed. All awakes, set effects, pets and etc. will have no effect inside the event dungeon! -Only Vagrant characters can join the event, so prepare Vagrants with consumables. 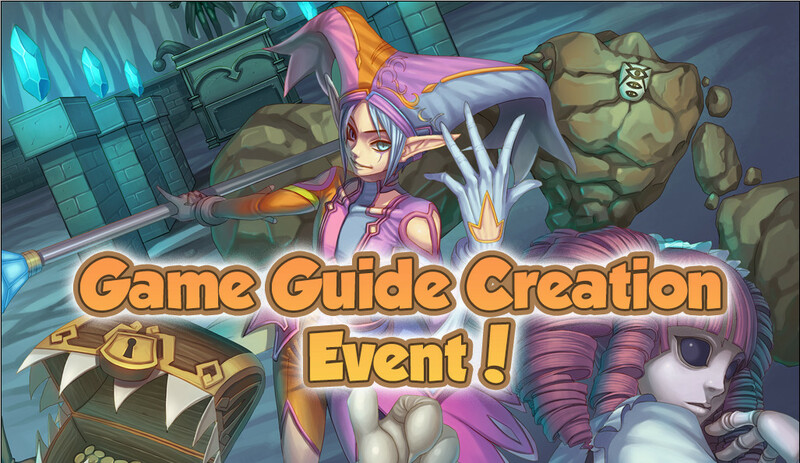 -GM will teleport all participants to the Exclusive Event Location. -Event consists of infinite number of rounds. Each round, weak aggressive monsters will spawn. Succeeding rounds will spawn stronger monsters. -Monster will more likely to spawn on places with more players or spots where monsters cannot reach like on top of a statue. -You can join multiple characters as long as you can control them. -All Vagrants can either hide, run, or kill the monsters to survive. Using of hp or any consumable is allowed. Champion: +10 Level 60 Green Set (0/4) and +10 Guardian weapon (0/7) of choice! Runner-up: +8 Level 60 Green Set (0/4) and +8 Guardian weapon (0/3) of choice! Thank you for supporting Flyff Iblis! Our Facebook Ads campaign video is near 2.5 million views and we need your help. Step 2. Like and Share this video on your Facebook wall (https://www.facebook.com/flyffiblisv15/videos/1381375378551128/). Make sure the post you shared is set to "Public" so we can verify it. Step 3. Using the Facebook account you used for sharing, send a message to our page (http://facebook.com/flyffiblisv15) indicating your In-game name. Follow the steps properly to get a free "Event Gift Box". If you tag at least 8 people on your post, you will get another free "Event Gift Box". Total of two giftboxes! Just make sure to set your post to "public". Each box contains 10x Scroll of Amplification ES (S), 15x Upcut Stones, 10x Vital X, 10x Refresher Holds. The box and its contents are non-tradeable. Event runs for a month. A character can only be rewarded once (twice if you tag at least 8 friends). Also, each facebook account can only be used once for sharing. The facebook account should have atleast 150 friends to avoid dummies or event abuse. Gift Boxes will be sent at the end of event period. If we reach 2.5 million views on the video before the month of February ends, we are throwing in a month-long 3x DROP Event! What are you waiting for? Share the video now to your friends and family! Valentines Event: Blast of Love! January 31, 2019, 12:00 a.m. 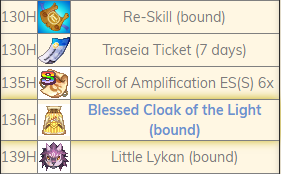 Event duration: February 4 - March 4. New Year's Level Up Event! January 3, 2019, 2:44 p.m. Happy New Year FlyfFFers! New year, new start, new character! From January 7 to March 7, there will be more level up rewards for newbies on their journey to higher levels. It's time to make that new character you've been planning for. Please note that all reward items are non-tradeable. Happy Leveling! December 8, 2018, 6:06 p.m.
Help Danny the Snowboy find the items needed to rebuild his Dad. 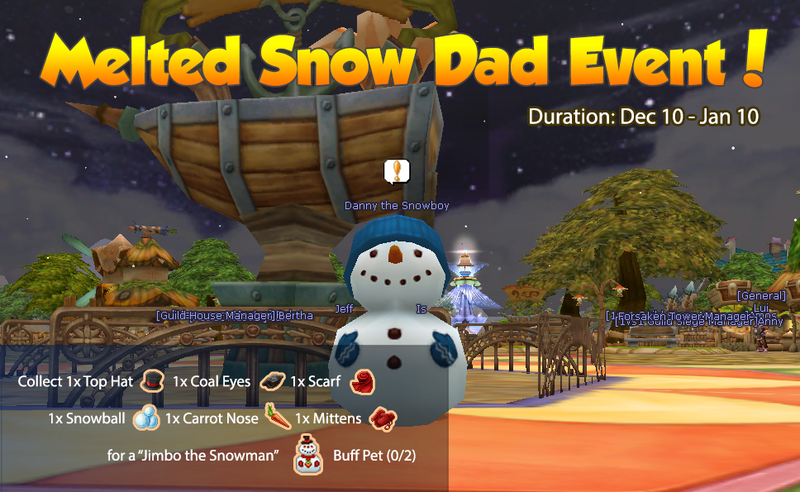 Collect the following items (1x Top Hat, 1x Carrot Nose, 1x Scarf, 1x Mittens, 1x Coal Eyes and 1x Snowballs) from any Masquerpet level 15+ and bring them to Danny. He will reward you with an unreleased buff pet! All parts needed are bound and cannot be traded. The buff pet reward is tradeable. December 2, 2018, 6:30 p.m.
We've mistakenly gave away permanent wings instead of 3-day wings during our past login-event. In case you missed it, you can score these free stuff again! This event is very simple. All you need to do is to stay logged-in for at least an hour to receive the gift assigned on that day. Be sure to take note of the dates! Login event works on Channel 1 only! Gifts are only sent once per day even if you stay logged-in for more than an hour or the whole day. All rewards are bound. It's time to share the love, shout for joy and exchange cheers as we await Christmas! Cheering your friends give them 3x EXP rate! You get a cheer point every hour logged in. Thank you for supporting Flyff Iblis! Our Facebook Ads campaign video has reached 2million views this already but we still need your help. 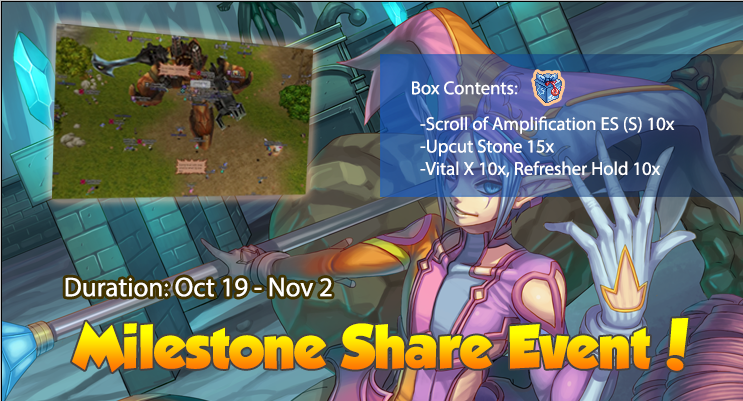 Each box contains 10x Scroll of Amplification ES (S), 15x Upcut Stones, 10x Vital X, 10x Refresher Holds. The box and its contents are non-tradeable. Event runs for two weeks. A character can only be rewarded once (twice if you tag at least 8 friends). Also, each facebook account can only be used once for sharing. The facebook account should have atleast 150 friends to avoid dummies or event abuse. If we reach 2.1 million views on the video before the month of November ends, we are throwing in a month-long 3x DROP Event! What are you waiting for? Share the video now to your friends and family! 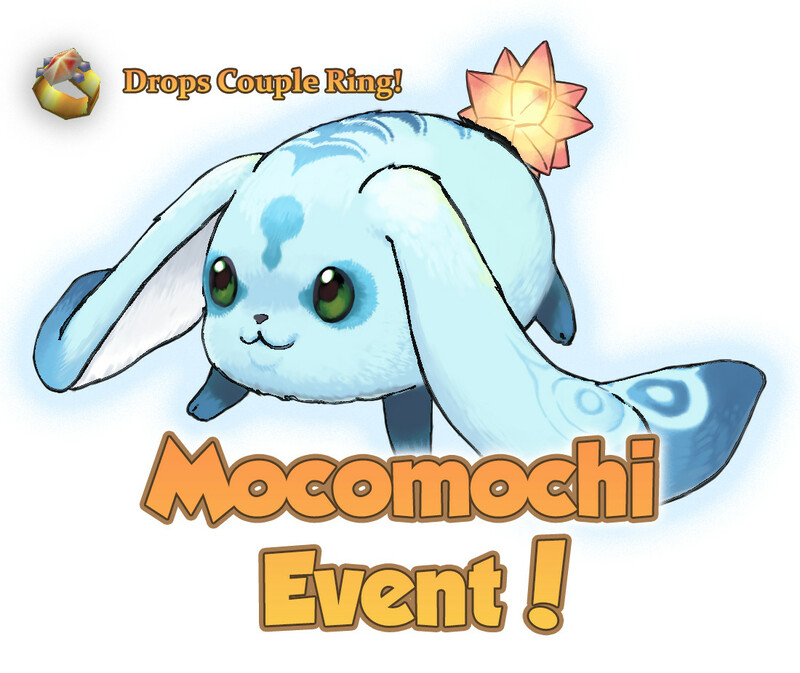 Cute Mocomochis will spawn randomly on both channels. The rare masquerpet might drop Couple Rings, Fireworks and Clown God Hats! After a day of testing with various Masquerpets, there was a noticeable increase of Green/Set item drops after reducing the drop rate of Blue/Normal items. Blue/Normal item drop rate reduced to 1x and Green/Set item remains 2x. Click the image below to access our FT1 page! A new breed of PvP experience is finally here! Upgrade your weapons, refine your armors, gather your accessories! Wait, you heard that wrong! No need to do that because this competition is all about skill, formation, and strategy! All equalized gear, consumables, and level! 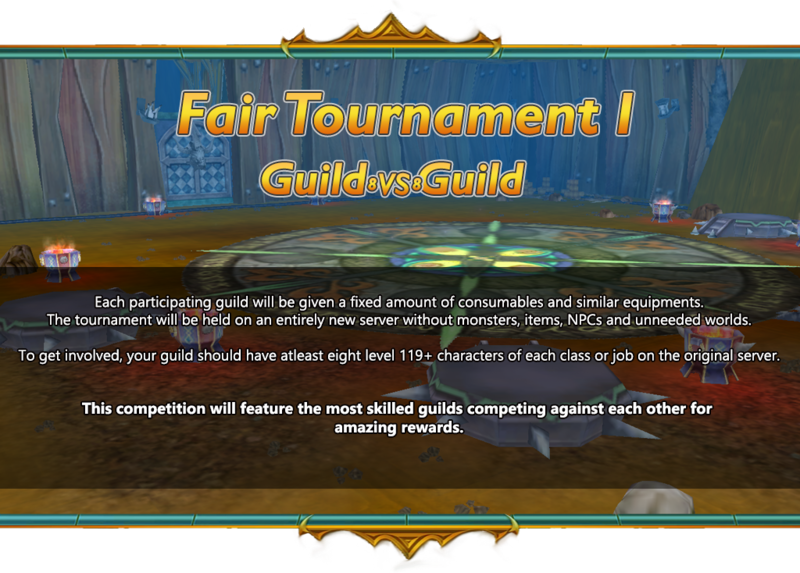 Does your guild have what it takes? Click here to visit the tournament page. 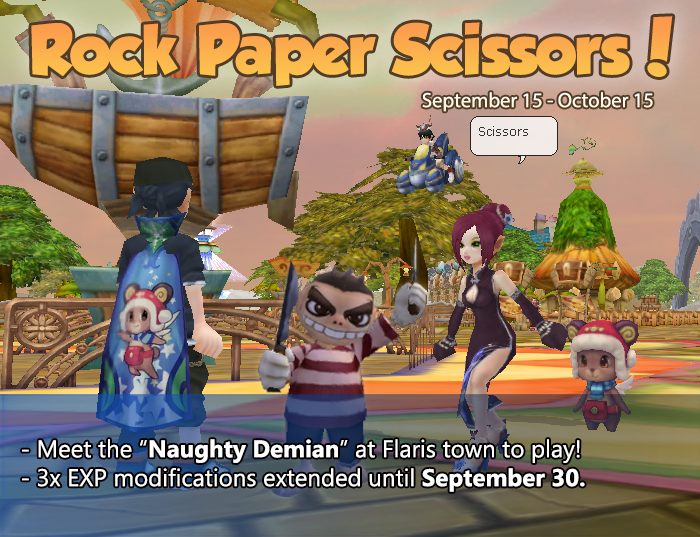 Rock Paper Scissors + Extended EXP event! September 14 2018, 6:05 p.m.
For those of you who are looking for that extra oomph to reach 3rd job or max level, here you go! 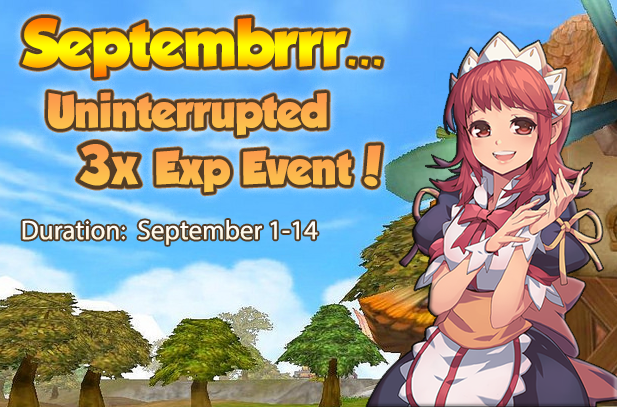 We are extending the Septembrrr 3x EXP modifications until the end of September. Pure leveling goodness! Win twice in a row and you'll be rewarded with 5 Event Moonstones(bound) . Win 3 times in a row and you'll be rewarded with 8 Event Sunstones(bound) . 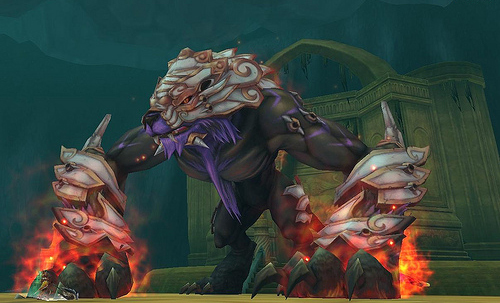 Win 8 times in a row and you'll be rewarded with a Kuma Buff Pet. Win 9 times in a row and you'll be rewarded with a Model TR-ex flight item. 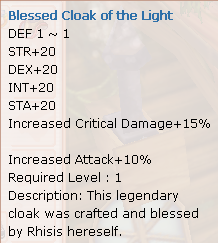 Win 10 times in a row and you'll be rewarded with a Kuma Cloak . The catch? 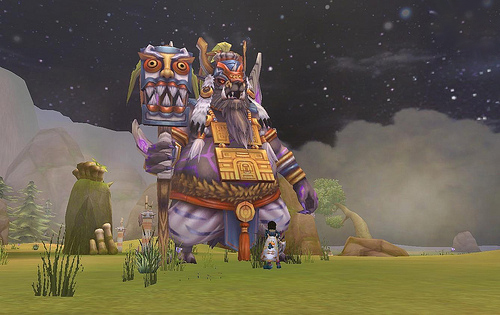 Well, you need to hunt for Pumpkins which are dropped by all Masquerpets level 15 and above. Trade 5 Pumpkins and 100,000 Penya for a Coupon from the "Mayor of Flarine". August 29 2018, 8:01 p.m.
Greetings everyone and welcome the month of September! Experience multiplier will be increased from 2x to 3x for 2 weeks from the 1st to the 14th of September! You're reading that right Flyffer. Take advantage of it now, the leveling is going to be swift. It's time for grinding and the break affords you all ample time to do so! August 25, 2018, 1:27 p.m. Already applied? Check if you see your name on the list at flyff-iblis.com/tournament2. List will be updated every 2-3 days. Attention people of Madrigal! The Flyff Iblis Dueling Tournament is coming again! We call upon the strongest challengers for a competition, come together the greatest warriors of all eight different superior classes. The tournament will establish the supreme warrior in each of these eight crafts. The winners will be rewarded gratefully! - The event will be held inside a secluded dungeon on Channel 1. - This will be a single-elimination type tournament with 1 round, and best of 3 rounds for each job's finals: Winners will progress to the next round and losers are eliminated. - Only levels 100 and above can join. Hero, Master levels can join as long as level is 100 or above. - There will be 1 winner per class/job. *There will only be 1 winner for Billposters, and Forcemasters because they belong on the same class. - Participants who are offline during the event will be disqualified. Short grace period will be given and toons who are both online will be prioritized first to duel. - You may only enter one character per class into the tournament. *You cannot join another Billposter that you own if you already applied a Forcemaster. - Players who are caught joining multiple characters of the same class will be permanently banned. - If you are unsure about the timezone time. Check out Time Converter to see what time will the event be on your location. Add a city for example China Beijing(GMT/UTC+8) September 15 8PM and then add your city/location. - 8 winners of a clean 125 set of their class/job (this set parts can also be hunted from Kheldor Boss). - Using cosumables that restores HP (Health Points) is not allowed. Fail to comply will result to disqualification. - No complaining about gear, level, and use of consumable/buff item advantage. - Disconnections or crashes will disqualify you unless it is found to be a server issue. 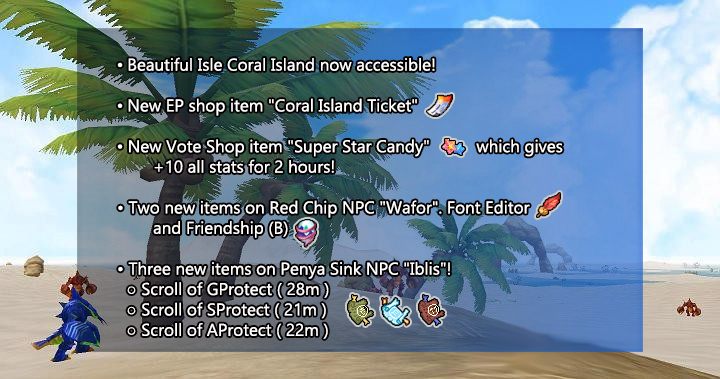 - All Premium Shop items will be allowed except consumables that replenish HP (Health Points). - Hopping on board or broom will disqualify you. - The only buffs allowed are whatever self-buffs you can cast directly on yourself, and whatever buffing consumables you decide to use. - If a player who is not currently competing heals or buffs a player who is, the player who casted will be penalized. - You may only enter one character per class into the tournament. Which means you can enter as many entries as you can as long as they are different jobs. ex. *You cannot join another Billposter that you own if you already applied a Forcemaster. 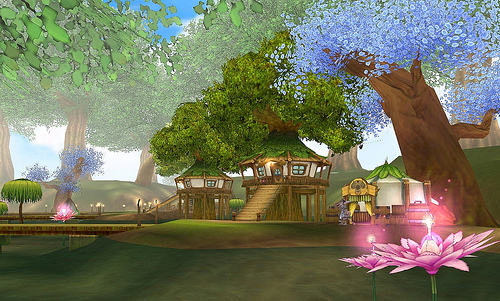 - Players who disrupt the dueling or approach the dueling ground or area will be penalized. - Ringmasters/Billposters/Seraphs/Forcemasters will be allowed to perform self-heal abilities, such as casting the Heal spell, or using their Prevention skill. - Scroll of Reduction can be used. - Sign-ups will open up on the 25th of August. - Up to a maximum of 20 FlyFF characters per job slots will be filled. Limit: 1 character per account. - You may only enter one character per class into the tournament. ex. *You cannot join another Billposter that you own if you already applied a Forcemaster. - Only the first few characters who meet the level requirements and those who send an email in the proper format will be accepted. - Emails that do not follow the email subject, email body, email format, spacing, spelling and text case will be rejected. Dear Iblis, I grasp the concept of war, fame and glory. I demand entry into your tournament! August 19, 2018, 10:50 p.m.
Greetings Flyffers! We are bringing you Premium Box Drop Event. 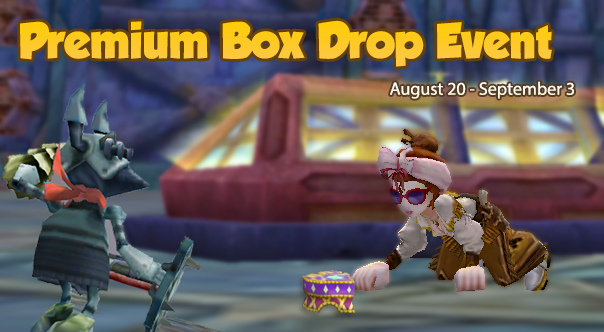 For the next two weeks, Premium Boxes will be dropping off of any regular masquerpet level 15 and above! These are some unusual boxes so enjoy farming them! July 22, 2018, 6:31 p.m. Create any tutorial about the game so we can help new players. You can compose leveling, build, quest guides, or any tutorial beneficial to new players. - You should not copy or plagiarize existing guides scattered on the internet. - If someone already posted a "leveling guide", you can still post another "leveling guide" for we will chose the best. - You should compose your guides in English only. - Criteria for getting winners: Uniqueness, detail and presentation. - You can post multiple guides but you can only win once. - We will chose 10-15 winners of 450 EPoints each. July 13, 2018, 10:31 p.m. 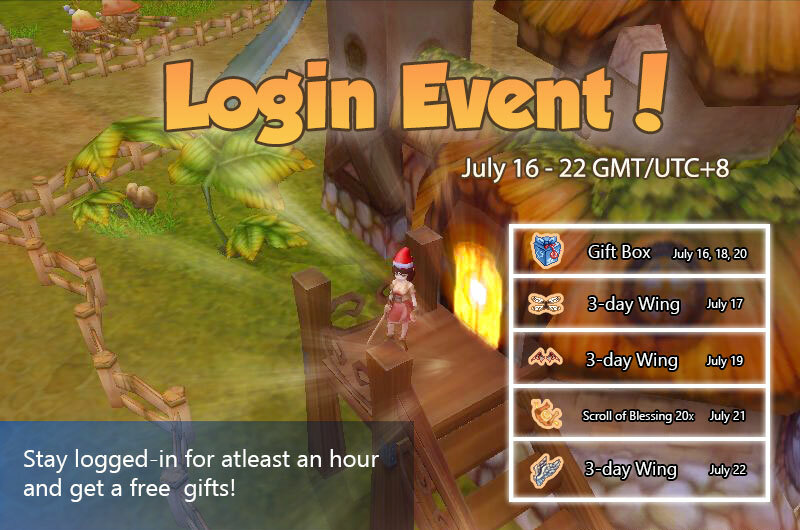 Enjoy a Login Event to score some free stuff! Gifts are sent once per day even if you stay logged-in for more than an hour or the whole day. All rewards are bound. June 24, 2018, 11: a.m.
As the seasons shift, Masquerpets appear! They are cute and they will invade Madrigal. Defend the towns from these critters. 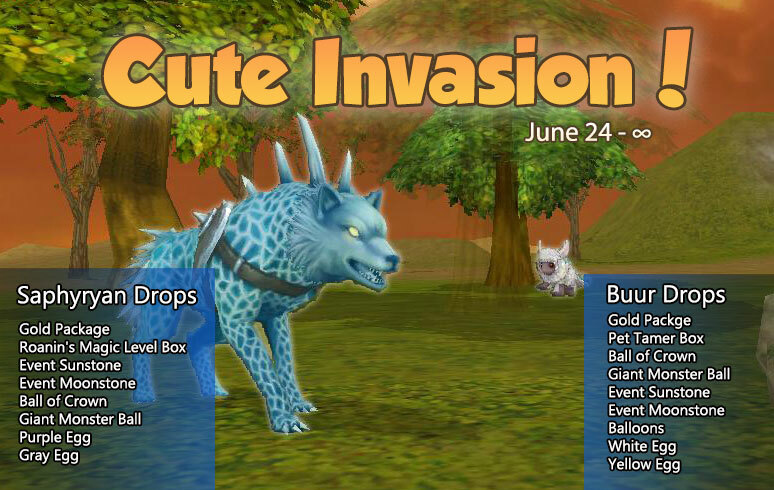 Starting June 24, cute monsters will appear and they drop some useful loot! Event runs for an undetermined duration. The rarest items you could get are "Scroll of Pet Revival (S Class)", "Chance of the Pet Tamer" and "Gold Package"! Transition to v16: Rise of Muran! May 5 2018, 11:08 p.m.
On May 19 6AM GMT/UTC +8, the server will be inaccessible for an undetermined number of hours to give way for v16 transition. All accounts, characters, items and EPoints will still be intact. Mobs: lvl 116-127 Boss: "Guan Yu Heavyblade"
New Zone "Kaillun" from north of "Valley of Risen" with a safe-zone city "Eillun"
Mobs: 129-134 Boss: "Chief Keokuk"
GuanYu Heavy Blade at Traseia drops accesories, gems. Chief Keokuk at Kaillun drops Stone of Balance, Crystal of Order. Greetings Flyffers! It's been a long time and version 16 "Rise of Muran" has arrived! 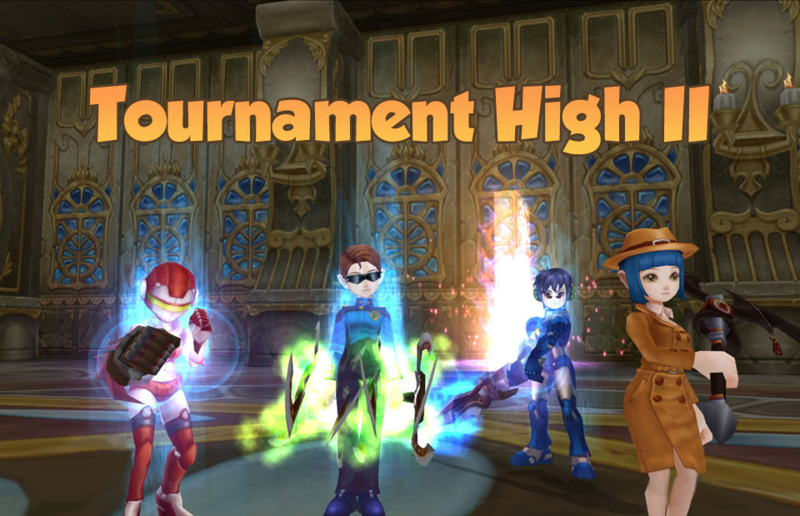 Grab your gear, prep up, and get ready to defend Madrigal once again on an epic proportion! To help all players to get started, everyone in game will get a global +300 bonus ATK. This little blessing from Rhisis herself should help you all out with leveling on the new maps. The attack bonus will be unnoticeable on the character info window and it has no buff icon like a global passive buff. Week-long uninterrupted 2.5x EXP Event! Experience multiplier will be increased from normal 2x to 2.5 for 1 week!